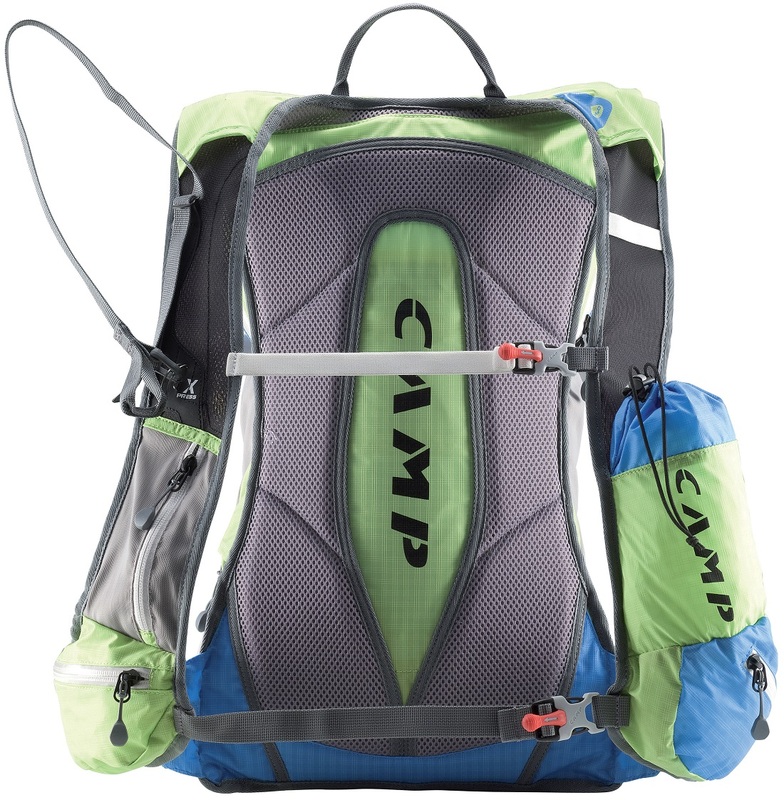 A new concept for light and fast ski mountaineering, the CAMP Skin is a vest-style backpack that a trail runner might have thought was obvious. Light-yet-durable fabric is designed to hold close to your body and have lots of easy access storage in the front. 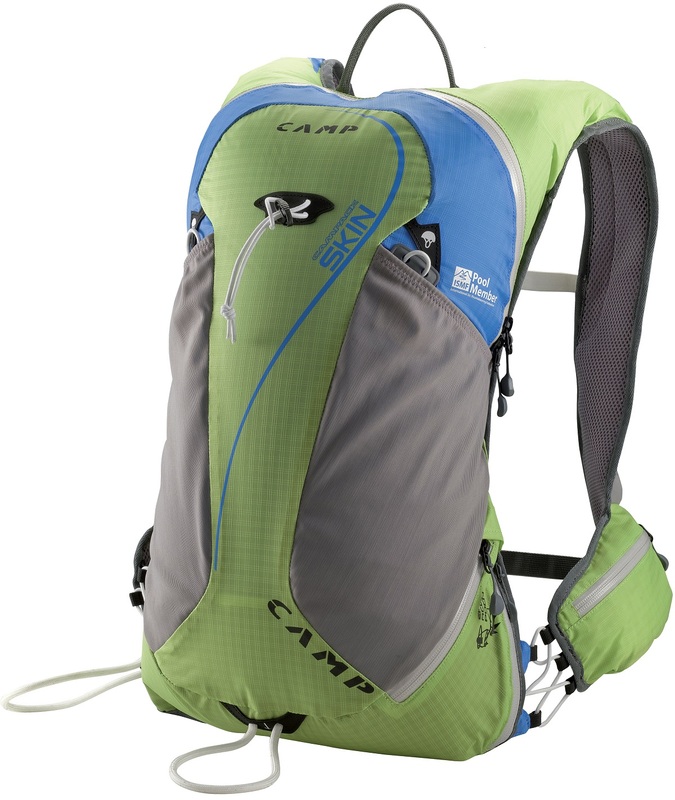 Plenty of mesh and ventilation channels helps regulate body temperature as you move quickly through the mountains. Add in special skimo features such as a ski carry, skin sized pockets, side crampon access, ice ax holder, and a helmet carrying system, and the CAMP Skin just might be the perfect on-snow day pack. Trail vest inspired design is streamlined to help you feel balanced while climbing or skiing with all the essentials. Xpress Wire ski carrying system allows attachment and removal of skis without taking off the pack. Zippered side access crampon compartment can be used for extra water or clothing and connects with the main storage via an internal zipper. EZ OP buckles on the chest and waist belt have a pull tab mechanism that can be opened with one hand. Ice axe carrier (fits 2) and an external helmet attachment system keep the bulky items securely behind you. Mesh pockets on the front can hold skins and two zip pockets on the waist can hold food or gadgets. Intergrated water bottle holder on the left shoulder strap and a mesh gel/phone pocket on the right keep you hydrated and energized. Internal security pocket and bladder compatible inner storage area complete the lengthy checklist. The CAMP Skin comes in two sizes. Small fits skiers under approximately 5' 9" in height, large will go up to about 6' 3". The tail loop fits skis up to about 145mm in width although the shoulder webbing is a bit short for skis that wide if the pack is full. Update 2015/16: CAMP switched to light blue highlights from grey. Otherwise the pack is the same. One of my favorite Camp packs (along with the veloce). Only major downside is the size small is a little too small to easily fit the Arva Plume shovel, but it may fit smaller ones ok. I really enjoy the vest-like fit for other sports like riding and speed hiking, and appreciate the small details like a zipper pocket inside, zippers rather than velcro for the crampon pocket, etc. I am 5'9", should I get the small or large? Hi Jason, the small should do just fine for you. how is a helmet secured? Hi Ronald, there are two retainers on bungee cords right above the mesh pockets. They are designed to slip through ventilation holes and then placed flat against the helmet surface. So far I have used this pack twice. Once at an informal weeknight race. I used a 1.5 liter bladder in the hydration sleeve, where there are 2 velcro loops that hold the bladder securely. You can run the tube out of either shoulder, but doing it on the right might get it tangled up with the ski attachment loop, so I went with the left shoulder. I put my glasses in the water bottle holder on the shoulder strap in case I needed them, since I didn't have a bottle in it. You could also fit a pair of very light gloves in there. Other than that just my phone/keys and a puffy jacket and gloves were in the pack. There was a booter and I was able to attach my skis pretty quickly as I had practiced at home. It's worth noting that the skis may be harder to attach when the pack is full. I am a big guy, 41 inch chest (bought the Large), and when I have the pack full the skis will not easily lay diagonally across the center of the pack. They end up sitting mostly on the left side of the pack and I can just barely attach the shoulder loop on the right shoulder with it extended to maximum length. It works fine, I can still attach the skis, the only downside is that the weight is not distributed evenly and the skis and particularly the bindings dug into my back a bit. I paused partway up the booter to adjust them for a little more comfort. All that said, I am using skis with an 80mm waist, so using race skis probably makes this less of an issue. It took some experimenting to make everything fit but it worked and you could probably fit a little more. It was comfortable except that the part of the shovel blade where the handle attaches poked me in the back because the pack has no padding down the very center. I stuffed part of a jacket in between to make it more comfortable. I stowed my 2nd bottle in the lower crampon compartment with some other stuff and I was able to swap it for the empty one with a little fussing without taking the pack off. On the final downhill back to the car I stowed my skins in the outer mesh pockets. They fit alright despite being a bit bigger than race skins. The pull-tab openers for the chest buckles seem gimmicky and I don't find them to work well or be any easier to use than a normal buckle, so I will probably snip them off. The helmet attachment system, as designed, will pretty much only work on the CAMP Speed I think, as the plastic pieces are meant to slip between the ventilation slits. I found a few other reasonable ways of attaching my CAMP Pulse though, without it flailing around too bad. The ice axe attachment system works fine. The only bummer is that removing the axe with 1 hand would not be easy due to the axe being slipped through a loop at the bottom rather than having a buckle like some other packs. The construction of the pack is fairly light weight but not paper thin. Should stand up to plenty of use. Overall I love the pack and I will be using it for any races I do. Depending on the weather and your preferred margin of safety, it may be a bit small for backcountry use. I will continue trying to use it in the backcountry whenever I can though, particularly in the spring. It's a great pack that accommodates efficient travel on skis. In the past few years I have become a convert to the vest-style packs coming out on the market - I love the close to the body supportive feel and freedom of movement. Last winter I was even using one of my trail vests ghetto-rigged for ski season. The CAMP Skin pack hits the sweet spot for me - fully decked with skimo features found on other larger packs (ski carry, crampon pocked, numerous shoulder /front pockets), but still the low-profile fit that distributes weight over your back/ chest well and feels much less restrictive than a larger pack with a waist belt - especially when you are pushing hard in the skintrack and sucking air with your gut like a bagpipe. The vest / pack is small enough that I have used it in a few races and never felt like I was toting around more than I needed, but large enough that i can carry everything could need for a fast and light day in the hills (including crampons, two ice axes, a bit of hardware and a 30m rope if I pull out my Tetris packing skills). Basically this has quickly become my go to pack for most days on skis - from racing to long days in the hills. If you are already smitten with trail vests, this will not disappoint. After you answered my questions I see that the Large is no longer in stock. Any plans to have it in again soon? Thanks! Hah, sorry, yes we expect more tomorrow! Oops, one more thing: will the skin pockets fit skins much bigger than race ski size? The opening looks kinda small. Smaller ones work better of course but the mesh pockets stretch enough to get some Hi5 skins in at 120mm in width. I actually just use those for backup gloves and throw my skins in the jacket to keep 'em warm on the descents. Any idea how big of a chest this will fit when full? I purchased a running vest in the past, and although my chest size was within the range specified by the manufacturer, I could barely get it on once I had it stuffed with gear. Hi Jake, I'm pretty scrawny (6'1", 38" chest if i breathe in) but when I ski with the Large fully loaded (which is relative, it's only a 15 liter pack after all) I have to cinch the straps most of the way to get it snug. Seems like it's got some room to grow, I'd guess another half dozen inches. i'm curious as to what width the wire ski carry system will carry. I am a splitboarder looking to get into a lighter weight pack and some other packs i've tried i.e. dynafit didn't have a wide enough loop to accommodate the 140mm width I need to fit my board halves. thanks for any insight! Hi Dan. We are posting the maximum size of the ski loops as we get them in and measure. The Skin pack is new this year so we don't have one to check but expect them by the end of the week. So far I haven't seen one that goes up to 140mm unfortunately. The X3 600 from last year only went to ~125mm. 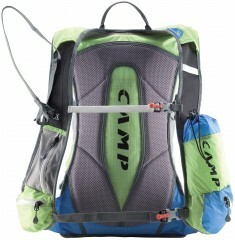 Dan, check out the Dynafit Broad Peak 28 which we just got in. It has an adjustable tail loop that will accommodate your rig.